Once upon a time, in a land about six hours away by car, Willow Creek Community Church only offered one conference every year for church leaders. At one point in the conference they'd turn off all their theater stage lights and use only the house lights while they talked about the importance of good lighting. They'd say, "This is your church on Sunday morning." It was as if the energy had been sucked out of the room. After a while they'd put the theater lights back on and everyone would marvel at the difference. It was as if the energy had been pumped back into the room. As you can imagine, lots of church leaders went back to their churches and tried to explain why they needed theater lights. Some got them installed. Lots of people liked it. Many didn't really notice. But a few were deeply concerned that the church had lost it's way. Now the vast majority of churches use this innovation and no one complains. Five Oaks has used theater lights and splashed colored lights on walls and curtains for years and no one ever indicated a concern. No one. 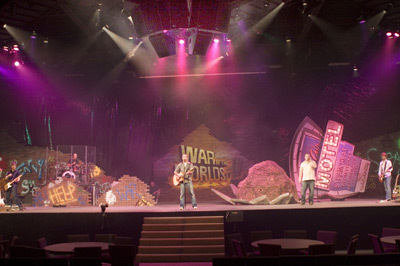 Over the last few years churches have added several dimensions to lighting. I had never really noticed it. Yes, I knew something was different but I didn't know what and I just didn't bother to ask. Then I was told about intelligent lights a short time ago. Intelligent lights do all the things our theater and floor lights have always done, but they do it better. You can change their position with a joy stick, change colors and change the diameter. One light can do what use to require several stationary lights. We recently added some intelligent lights. It's a simple innovation. Lots of people really like it. Many haven't really noticed. A few... You can finish the story. Then you can write your own about outlines to overheads to PowerPoint to Video or about organs to guitars to drums to electric guitars. There's an interesting one about bar songs to mighty hymns, but that one is from a time and land far, far away. 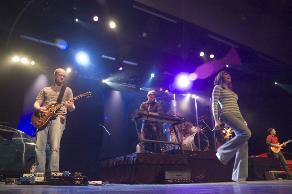 Redeeming technology and the arts for Kingdom purposes always produces an interesting story. And at Five Oaks, you get to be a part of that story.